Hero Arts released some great new digikits on Tuesday. On of them is the fab Birthday Wishes Digikit. Just a sentiment, an image and lots of possibilities. Hope you enjoy the end of your week, see you again soon. Love your cute card, Lucy! 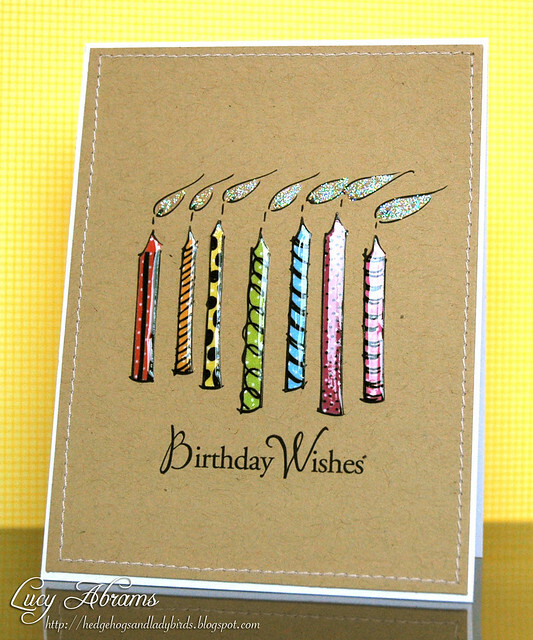 Your colourful candles look wonderful on the kraft! Beautiful stitching, too! Oh this is so beautiful. Simple and sticking. Amazing! The glossy accents and glitter So make this card shine!Perfection! This would also work for the Blogger Challenge this week. Check it out on my blog if you'd like. Oh and I loved your little Fox Valentine card below as well. Love those glossy candles, Lucy! Fun card! This is beautiful, Lucy! I love all those colours and glossy accents on kraft! Fabulous! The glossy accents is a genius addition! Delicious! Love all the glossy candles, they look like they could be eaten too like yummy candy! this is so fun, Lucy! love the shiny candles!